While many brands have core design elements that immediately let guests know what kind of hotel they’re in—like the central atrium at Embassy Suites or the “Living Room” lobbies at W Hotels—Marriott International’s Renaissance brand offers much more latitude in terms of its looks. Its recent renovation and new-build push, therefore, focused more on reflecting location rather than adhering to brand standards, and gave designers a chance to create unique elements. 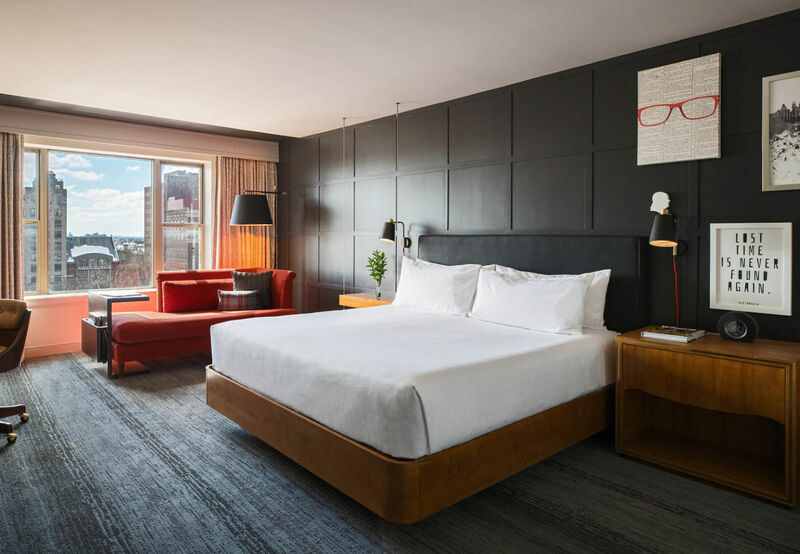 When the Renaissance Philadelphia Downtown Hotel opened this spring, its design, courtesy of Campion Platt, combined the historic fabric of the city with a modern energy, contrasting materiality and pop art throughout the hotel. The reimagined lobby, reminiscent of historic Elfreth’s Alley in Old Town, is anchored by a 100-foot graffiti wall designed by local artist Dan Murphy. The hotel’s restaurant, meanwhile, displays portraits of Benjamin Franklin’s five mistresses created with pixelated $100 bills.